Geist & the Sacred Ensemble forge a doom-inflected folk ritualism; dirges tinged with Eastern psychedelia and meandering meditative trances. The singing is with a deep and slow delivery, further heightening the groups mystic aspirations and heady sonics. 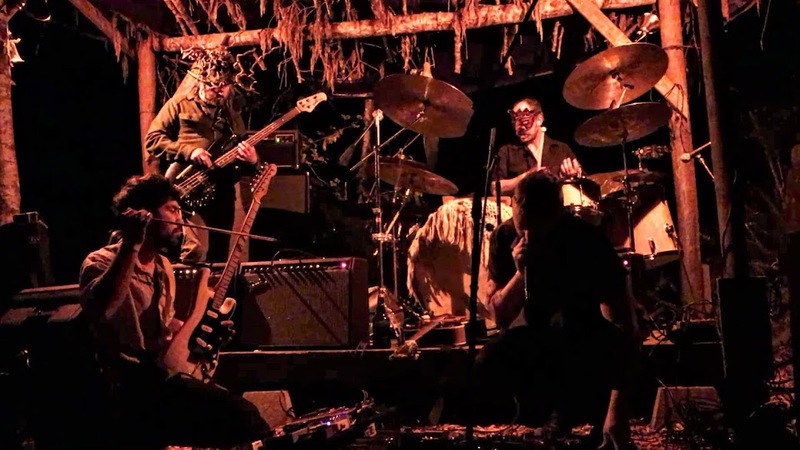 At their greatest, Geist & the Sacred Ensemble’s tunes exist as an ever-changing pilgrimage; transforming their abstract drifts into apocalyptic folk hymns or private confessionals. In addition to acoustic and electric guitars, bass and percussion kits. They use gongs, gamelans, banjo and tools like power drills, hammers and chains to add texture. Geist started in 2005 after Michael Sauder left Geist Road in Lancaster, Pa and hitched-hiked around the country with a childhood friend. The music is inspired from that trip and experiences of growing up as a gravedigger from a Christian household. In 2007 percussionist Samuel Joseph came in to offer his rhythmic wizardry thus becoming Geist & Samuel Joseph. In 2008 they self released their self-titled ep 'Geist & Samuel Joseph'. The following year they started to have a rotating cast of musicians and Geist & the Sacred Ensemble was born. In 2011 they released their first full length 'In Search of Fabled Lands' on cassette for the independent record label Translinguistic Other based out of Seattle, Wa. In 2013 they released 'Beyond this Vessel' on cassette followed by 'Within' in 2016 on Oakland based label Moon Glyph.